A few weeks ago, I served a version of this for an office team of 30! Preparing lunch for a team of 30 people might seem like an exhausting task, but with the right recipes it doesn’t have to be. Don’t worry, this recipe only yields 8 portions. I made this version even easier by using store-bought ingredients like roasted peppers and artichokes, which means there’s no standing over an open flame or hot stove to roast vegetables. If you’re not able to find jarred peppers or artichokes, check your local deli or Italian grocer. Most recently, I made this for a group of friends who came over for dinner. The best part about it was that I assembled the dish earlier in the day, stored them in the fridge; and since they cook in only 15 minutes, I baked them in the oven just as our friends arrived. Add the roasted peppers, roasted artichokes, olives, capers, feta cheese, garlic, scallions, oregano, sea salt and pepper to a medium bowl. Gently stir to combine the ingredients, being careful not to break up the feta. Taste the mixture to see if you need to add more salt, which depends heavily on how salty your olive and feta make the mixture. Set the mixture aside and make the zucchini shells. 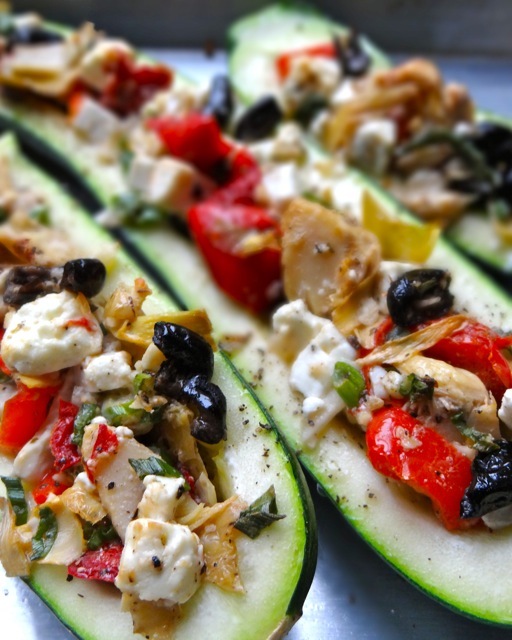 To make the zucchini shells, slice the zucchini in half lengthwise. Next, using a teaspoon, gently scoop and scrape out the centers of the zucchini. Season the the zucchini shells with sea salt and pepper. Fill the seasoned shells with the filling then, place them snuggly in a baking tray. 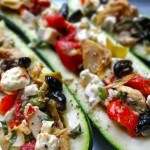 Bake the zucchini for 15 minutes, the shells should be crisp-tender. Serve hot.